BlackBerry CEO John Chen spoke with Walt Mossberg and Ina Fried at the Code Conference on Wednesday, and discussed how parts of BlackBerry were sicker than he thought they would be when he first took over last November. The company still has many problems, according to the executive, but is not close to being laid to rest. Chen talked about security and how BlackBerry is looking at specialized businesses where it might be able to sell its wares, such as financial services and healthcare. There was an interesting moment when the executive was asked about building Android powered handsets, and he replied that he couldn't talk about that yet. At the same time, Chen said that he wasn't giving up on the handset business. "I am not by any shape of the imagination… giving up yet," he said. 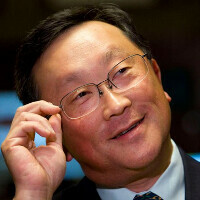 Talking with Mossberg and Fried, Chen said that he is trying to get developers over to the BlackBerry 10 platform. Taking his words from Charlie Sheen's Bud Fox from the epic movie Wall Street, the BlackBerry CEO said, "We're working on some of that stuff." All in all, it was an interesting chat with the man who is trying to turn around BlackBerry. He succeeded before with Sybase, so he is a proven turnaround specialist. You check out some of the conversation by clicking on the video below. JC is a very good leader/CEO. All the best to him. Trolls (Nickolas, Apiksula, Ajigtiani, Mxyzptlk, Liveitup and rest of the crew) do what you do best, show your true self. What's worse; the fanboy that defends a dying company or the troll that tells you that the company is dead? Trolls of course. And, they're not dying yet. And I don't see anything wrong with defending the brand you own. Doesn't necessarily make him a fanboy. What do you do? Do you defend your company? or do you troll other brands ? . . I defend when I see wrong. But I defend BlackBerry mostly because the majority of the people I have mentioned in my comment as you can see are proving me right by doing nothing else except troll. And I thank them all from the bottom of my heart. Example: Apiskula (with this name) has been saying falling company, dead company and so on for at least one year. I just don't know when is it that Apiskula thinks BlackBerry will hit the ground? One year falling and still falling, BlackBerry must be from another galaxy to have not hit the ground yet. Totally agree with you. I defend companies that I support, just like you. I also wonder what makes someone come to an article with absolutely nothing to say at all besides "death to this" and "die already" all of the time. Do the trolls have nothing better to do with their time? And what, exactly, makes him an idiot? Could you do a better job than he has so far? I highly doubt it. OK, so that's you and your opinion. Obviously, there were good points to taking the job at BlackBerry or a guy as renowned as Chen would not have taken the job. Clearly there are still people that want the technology, hence BlackBerrys commanding lead in enterprise, to name but one thing. And we BlackBerry fans are ECSTATIC that a guy like you didn't take the job. I highly doubt you have the expertise to lead a dog to a bone, much less lead a company like BlackBerry. Wrong. Execs are getting FIRED that don't align with John Chen's vision. There is a difference. And yes, I am BlackBerry supporter, user and FAN. You have a problem with that? Not that I care in the least if you do. It takes balls to do what he is doing, and apparently you don't have it in you. We are all grateful that you are not the CEO. He is a good leader, Thorton Heins however destroyed Blackberry only true chance at relevance. The smartphone war is no longer about single devices, its about eco systems. One thing i am not is a troll, I don't go around bashing other platforms i would point out from time to time examples of how some bash a platform while their fav platform who they love and praise copies the same OS that they bash, hypocrites. I know technology and call it as it , there is a major difference between having a valid point and hating on something. I don't engage in the latter. If i said that for eg. that BB Z3 upper half of the homescreen looks like WP homescreen, no more traditional BB homescreen at least not part of it. That is making a valid point in my opinion, not trolling. http://www.phonearena.com/news/BlackBerry-Z3-ramping-up-for-launches-in-India-and-Malaysia_id56554 http://windows8search.com/wp-content/uploads/2012/07/Windows-Phone-8-redes-live-tiles-01-thumb-550xauto-94234.jpg I prob have only commented on BB articles about 3 times in totality. Yourself and and the numerous Android fansboys like Aftershock, sgodsell, 0xFFFF , Arte-8800, corporateJP etc are Trolls, see them hating in upcoming WP articles, watch and see. Learn the difference, don't misuse the word. And yourself, TROLL, and your previous banned accounts. I think you have confused the word "troll" with the term "good samaritan". I see your list of good samaritans -- Aftershock, sgodsell, 0xFFFF , Arte-8800, corporateJP. These kind souls are helping strangers find a better path, whereas your hatred and bias blinds you and you see only "trolls". It's sad, really. BlackBerry is building its ecosystem. Its ecosystem is just in enterprise and not the consumer market. That I can't argue with. Maybe you are right, BlackBerry has prioritized enterprise over consumer market and I will agree with that. Indirectly you are agreeing with me that BlackBerry is not dead, which is what the guys I have mentioned in my first comment have been screaming for the past 2-3 years. I DIRECTLY AGREE with you that BlackBerry is not dead. They have much life left in them and will persevere, of that I am certain. Plus one to you. How about when ppl point out that Flat UI, or the WP style look was done before WP launched....yet ppl keep harping on Wp design being copied in almost every article they post in... is that trollish? Liveitup, please stop saying that BB10 looks like WP. It does not. I a BB10 device and a WP, so I can speak on this and see the difference. He forgot about himself in android articles too. Let him have his cake, it is after all..
You clearly did not read what I stated besides I never had a cake to begin with, its hard to eat what you never had. Hhmm, I did read it, you called a bunch of posters myself included trolls. While ignoring your own postings in android threads as somehow above all that, no? You're a harmless troll I'll give you that, but still I'm pretty sure i have saw WP diatribe in android articles from yourself. Correct me if I'm wrong that you have never posted WP praise in android articles? Honestly.